This is a Hawthorn First Eighteen but the date could not possibly be 1918. For example, rover Ted Pool is seen in the photo. Pool was born in 1906. I found the writing very obscure. The written date is likely to be 1938, the year Pool retired at Hawthorn. Bert Mills (Hawthorn captain 1932-34, 1938) is at the centre of the group. 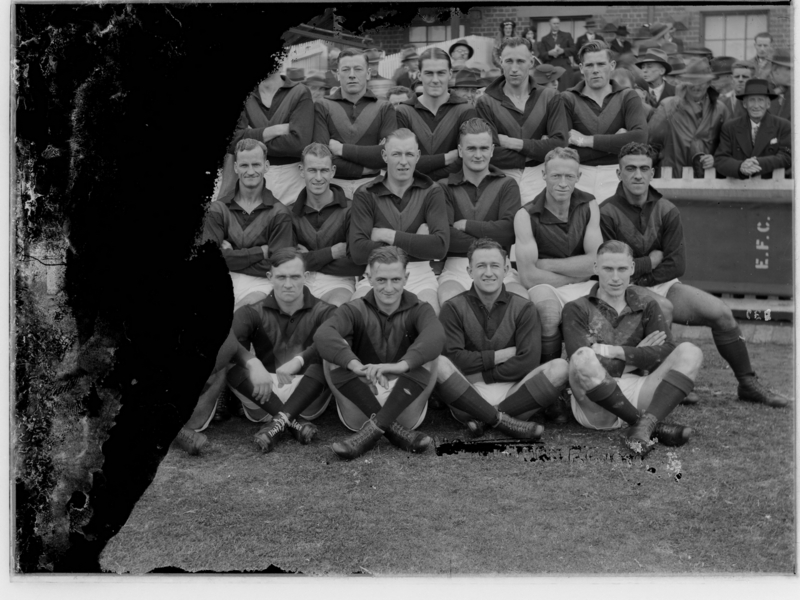 Further research has confirmed this is indeed a Hawthorn (VFL) Senior Team of 1938. They are photographed at Essendon Football Ground (Windy Hill). Note ‘EFC’ on fence. Presumably therefore this is the Round 7 match of 1938 which Hawthorn lost by thirteen points after leading at three-quarter time. All have white shorts. It is a pity there is so much emulsion damage on the left-hand side of the image because the quality otherwise is very clear.